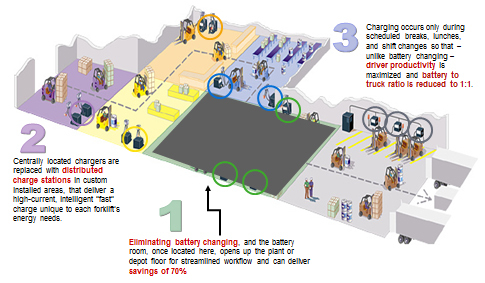 Battery Protection Technology identifies each battery as it is connected so it can automatically custom-charge several trucks and batteries of various size, capacity, and duty cycles simultaneously. Advanced software also maintains optimal charging levels by monitoring temperature and regulating each charge. Data Delivery Technology records all critical charge events and battery data from each truck to make fleet management easier and more effective. This charge history is especially useful in fleet and asset management, helping you to track truck performance, charger efficiency, and battery health.